The rough leaves and stiff stems give rise to candelabra shaped flower heads in midsummer. A butterfly nectar plant and a medicinal herb. 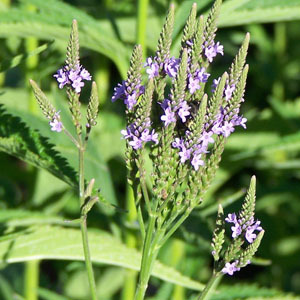 Flowers are very small, but the overall shape and stature of the plant is very ornamental. Categories: All Items, all potted plants, butterfly nectar plants, fruits/seeds for birds, hummingbird plants, native American plants, Potted Plants, More..